Srirangapatana an island citadel on the River Cauvery in the Mandya district of Karnataka State is known for its religious, cultural and historic importance. Located 19 km northeast of Mysore city, beside the Mysore-Bangalore highway its name is derived from the temple of Sri Ranganatha, located within the walls of the Fort. A major tourist destination in Mysore, Srirangapatana attracting a large number of visitors. 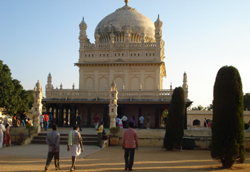 The island town of Srirangapatana has a mosque, a temple, Tipus summer palace; Daria Daulat ornamented with wall paintings and Gumbaz and his Mausoleum with ivory inlaid doors. Situated on a low rocky island 5 km long 1km wide the middle of the Kaveri River, it was built under the Vijayanagar Kings in 1454. The fort was witnessed the battle fought here by the British forces under Lorud Cornwallis and General Harris in their attempt to subdue Tipu. After this battle the British established their supremacy in Southern India. Srirangapatna can be divided into two parts. One part of the island is dominated by the fort complex and places and the second part dominates the Ranganathaswamy temple and Juma Masjid. Tourists can complete their visit to Srirangapatna within 3 hours. It is a large complex with two concentric enclosures. One among the Pancharanga kshetram (Five holy places of Lord Ranganatha - others are Srirangam, Tiruvindalur, Kumbakonam and Koyiladi) along the river Kaveri, Sri Ranganatha Temple is said to have been built by the Chieftain Thirumalaiah in 894 AD was substantially resrtored in the 19th century. One of the most important Vaishnavite centres of pilgrimage in southern India, it has huge walls surrounding it, depicting ancient architecture. Just outside of the complex walls is a large chariot with wooden panels. One can enter the temple complex through the eastern imposing gopura. It is a five storeyed pyramidal tower. Dedicated to Lord Vishnu it has approached through a succession of columned halls and an open court with a glided lamp column. One of the main attractions of this temple is a reclining image of Lord Vishnu on the coils of the Snake Ananta. Famous for its exquisite carvings and beautiful architecture in Hoysala style, Hyder Ali believed to have made contributions and donations to the temple. Two pillars depicting Vishnu in 24 forms with their names arranged are noteworthy. Besides the shrine of Lord Vishnu, there are many other shrines inside the temple dedicated to Panchamukha Hanuman, Sri Krishna, Lord Srinivasa, Alwars and Gurus of Vaishanava faith. Puja timings : from 8 to 9.30 am and 7 to 8 pm. A festival Kotarothsava, an annual rath yatra is held in January, attracting thousands of devotees. Also known as Masjid-e-Ala it was built by Tipu Sultan, in 1787 A.D. It is a beautiful 2 storeyed building with two lofty minarets and a flight of about 200 steps leads to the top of each minarets. It also has Persian inscriptions mentions the date of the construction and others, the extracts from the Holy Quran. Situated near to the Ranganatha Temple is a ruined Tipu's Palace. According to many it was once a very beautiful structure. The palace was used by the British as their secretariat till 1867, after the death of Tipu. It is here where Tipu Sultan fell, betrayed by his own men during the fourth battle of Srirangapatna. His body lay there for two days before it was noticed by the locals. A cannon ball, a silent reminder of Tipu’s last battle (May 4, 1799). There is a Stone Tablet where it is engraved, 'The body of Tipu Sultan was found here'. Situated north of Ranganatha Swamy Temple, it was named after Colonel Bailey who died here in 1782 AD. This dungeon was used to imprison British prisoners like Captain Baird and Rulay, Colonel Brithwhite Sampson, Frazer and Lindsay. In the dungeon, the prisoners were chained to the stone slabs fixed on the east, north and the west walls. An extremely well maintained, Daria Daulat Bagh is situated 500 m south of the Fort. Built in 1784 by Tipu as a pleasure place it houses a durbar hall, resort and dining hall. . The main building which stands in the middle of a well maintained garden. The building has triple arcades surrounded by a verandah with tall columns which are carved with murals depict battles including Haider Ali's victory over the British. The Mughal art is seen in the carved woodwork and painted designs. The small museum upstairs exhibits maps, portraits and topographical scenes associated with Tipu Sultan, eighteen pencil sketches, Coins of various denominations and medals of different metals, costumes, furniture, arms, etc. Maintained by the Archaeological Survey of India it is open daily. Entry Fee : Rs 5/- per adult and camera fee of Rs 25/-. It is near to Daria Daulat Bagh just 1.5 km away. It was built by a French Missionery who worked here in 1799 -1823. Near to this a British Cemetery which has memorials of British Soldiers. The white domed Gumbaz is the burial chamber of Tipu Sultan, his father Haider Ali and mother Fatima Begum. Built by Tipu Sultan for his parents between 1782-84 A.D, it is a square tomb chamber with a dome. The monument stands in a garden with cypress trees. The entrance is from the east through an arched gate . The tomb consists of an imposing domed chamber surrounded by verandah roofed with angled eaves. It houses Tipu's tiger stripe emblem and his swords and shields.. The dome is raised high on a square chamber. 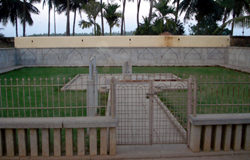 Both the bodies of Haider Ali and Tippu Sultan are resting in a crypt beneath the cenotaphs. The ebony and ivory doors were donated in 1855 by Lord Dalhousie, the Viceroy of India. Situated on the banks of the River Cauvery, it is famous for shooting song and dance sequences of regional films. A beautiful temple near to this ghat.